Creating the voice you want for your story or novel begins with Word Choices. It continues with control of your sentences. I emphasize control because many writers–well, they just write. Without consideration of sentence structures. 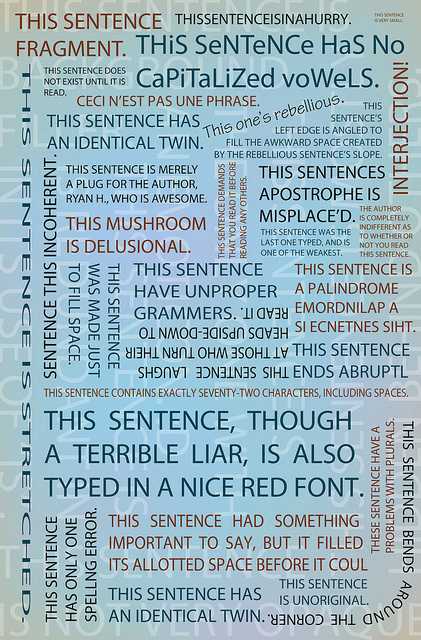 Sentences, as the basic building block of the written word, need careful attention. You can write long, short, simple, complex, parallel, convoluted or fragmented. Yes. Fragments work. When do you use which sentence structure. Here’s where it helps to read your work aloud, listening for a smooth flow. Does the writing disappear and let the story come forward, or does the writing force you to stop and read again for clarity? Are there frequent stutters as the rhythm of the piece breaks down? Where do you want the emphasis? In Style: Lessons in Clarity and Grace, Joseph Williams takes a scholarly look at sentences and how to manage them. Of course, there are lessons on omitting the passive voice, creating strong subjects of sentences and making sure there is clarity throughout. He also speaks of putting the emphasis where you want it to be. For example, I often ask people to look at a paragraph and identify the most important word/phrase in that paragraph. Williams says the ends of sentences are positions of emphasis or stress. So, I ask the writers to reword the sentence and put the most important word last. Consider the differences between these two sentences. It was the beginning of the Revolution. #1 is shorter and emphasizes that something has started. #2 is longer and emphasizes there is a Revolution. It uses the “It was. . .” construction to push the important information to the end of the sentence. A careful writer would weigh the disadvantage of the weaker to-be verb with the advantage of putting the word “Revolution” in the position of stress. The choice depends on where you want the readers to focus. It’s a choice that affects style, clarity and, of course, voice. Here are other posts on using great sentences to create voice.